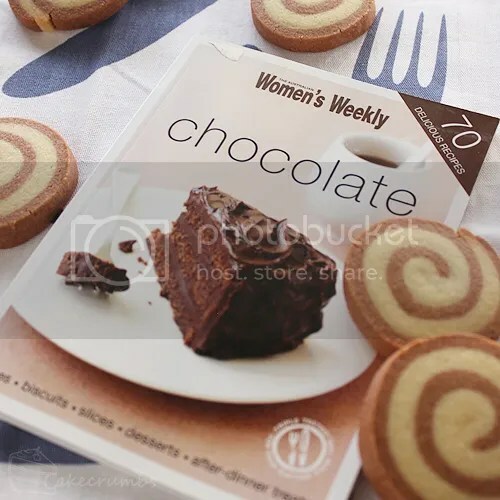 This week's challenge comes from one of my many Women's Weekly books simple titled 'Chocolate'. This is one of my books that has a lot of overlap with others, each of which people have gotten me as presents. They all offer something different, though, so I don't mind. I bake from these books a lot, and some of my favourite cake recipes come from or have been adapted from these books. The part this book has that the others don't is a cookie section. It's all about the old and classic in these ones. 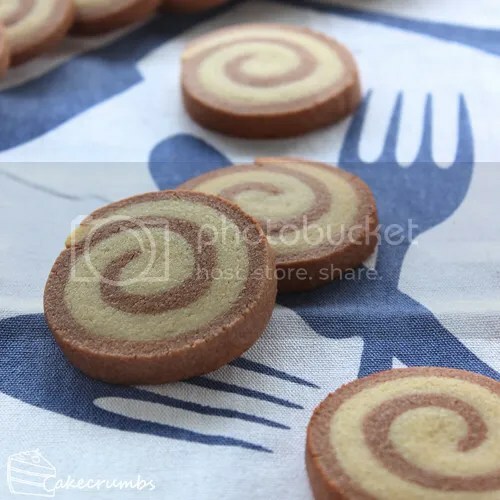 I've been wanting to try Pinwheel Cookies, on Choc-Vanilla Spiral Cookies as they are called in this book, for a while. The challenge was the perfect excuse. I made a couple of changes to the method for ease. The first was in the creation of the dough. It will tell you after the creaming stage to divide the mixture in half and proceed from there. I prefer to complete the dough so there's an equal portion of flour to butter ratio, rather than trying to eyeball it. So I made the dough up, then halved it, then kneaded the cocoa in. I do this any time I'm turning one batch into two flavours, colours and it works pretty well. Secondly, it will ask you to refrigerate the dough before rolling it out. I didn't see the point and figured it would only make the task incredibly difficult so I skipped it. Rolling it up takes a little patience and care, but the result for doing so is worth it, particularly at the beginning. 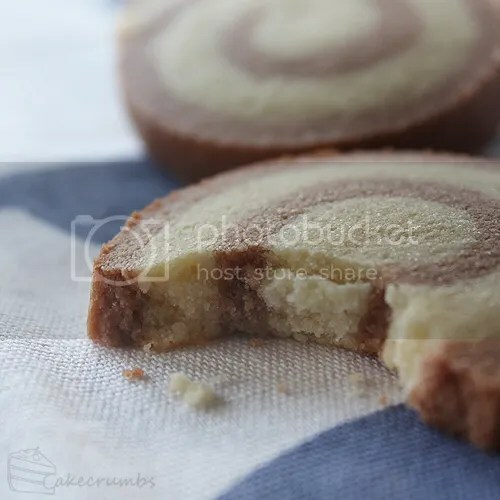 I noticed the photo in the book showed a lot of cookies that had gaps or cracks (or both) in the centre. I wanted to avoid that. It won't be long before you have your cookie log. Wrap it up in plastic, throw it in the fridge and forget about it until you want cookies. I baked half the log tonight and will save the rest for the weekend. I had thoughts of freezing the dough, as some cookie logs squish down when cut even after being in the fridge. This recipe was absolutely fine. It sets quite well in the fridge and didn't warp at all during cutting. A little while in the oven and they're ready to nom. The spirals came out so much neater than I was expecting for my first try. How you roll it will determine which swirl is in the middle, as well as how thick your dough is. 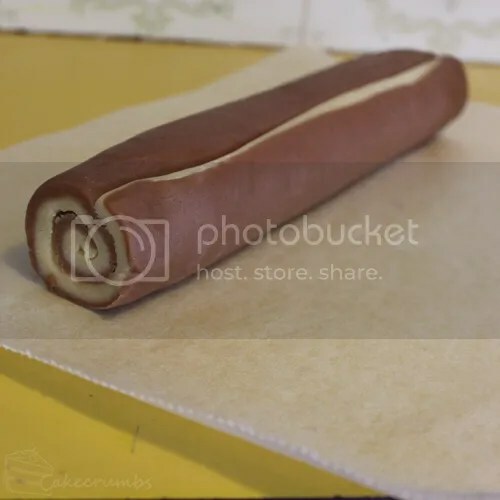 My vanilla dough was a little thicker than the chocolate, simply because I wasn't very pedantic. 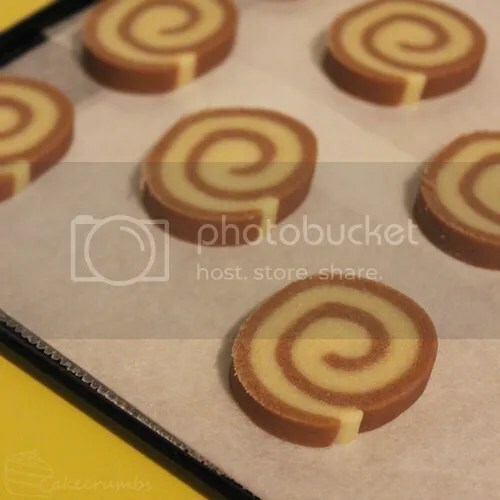 But I like the way the chocolate swirl then becomes the focus. The cookies sit right in the mid-range of soft vs. crunchy cookies. If you like your cookies really soft, you could take a few minutes off of the baking time. Otherwise, you'll have slightly crunchy, crumbly cookies. That suits me juuuust fine. Beat butter and sugar together until light and fluffy; beat in the vanilla and the egg. 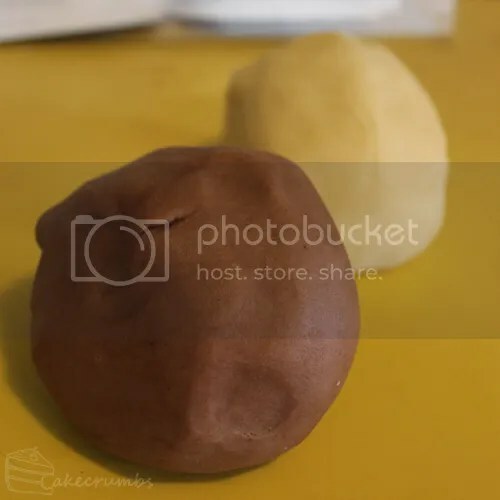 Divide mixture between two bowls, stir half of the flour into one bowl, mix to form a firm dough. Stir remaining flour and cocoa into second bowl. Knead each piece of dough separately, on a floured surface until smooth. Cover; refrigerate 30 minutes. 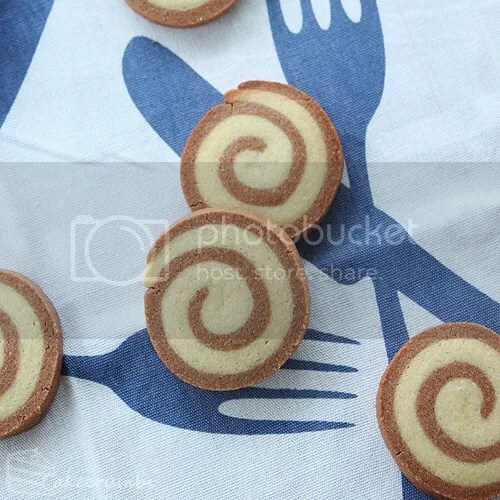 Roll vanilla dough between two sheets of baking paper into a 25cm x 35cm rectangle; repeat with chocolate dough. 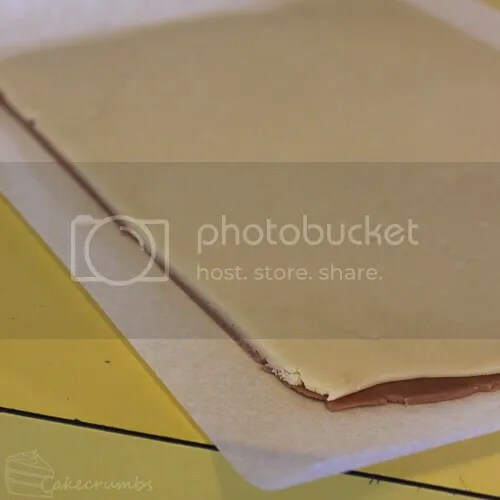 Remove top sheets of baking paper from dough. 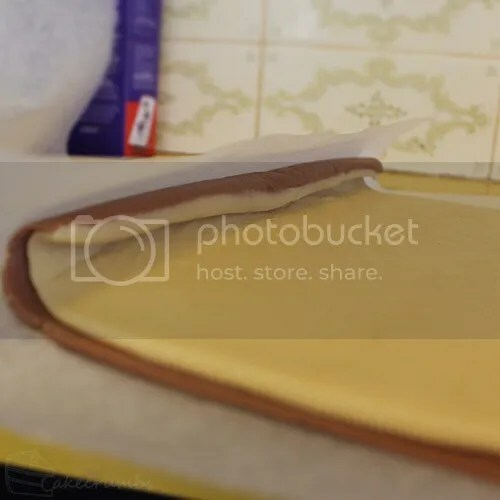 Turn vanilla dough onto chocolate dough; remove top sheet of paper; trim edges. Using bottom sheet of paper as a guide, roll dough stack tightly from long side. Enclose roll in plastic wrap; refrigerate 30 minutes. Preheat oven to 180°C. Grease oven trays; line with baking paper. Remove plastic from roll. Cut roll into 1cm slices Place slices about 2cm apart on trays; bake about 15 minutes. Stand cookies on trays 5 minutes before transferring to wire rack to cool. Download the printable version of this recipe here. I’m drooling here! This looks so delicious!! Those swirls are extremely neat! They look great. They were better than I expected! HAVE to try these tonight. My coworkers will love you tomorrow for making me want to bake. (That is, if I don’t set fire to my oven again as I did a few days ago..). Oh dear! How did it catch fire? Some butter leaked on the oven floor and I guess those fumes caught fire. We managed to put it out in time, though, and it’s working fine now 🙂 I just need to get used to putting some tinfoil on the oven floor so that if it happens again, I don’t have to clean the whole oven. Coincidentally, I baked these cookies yesterday evening and they’re sitting on my coworker’s desk now, staring at me. Whoops, accidentally replies when I wasn’t logged in. Awesome cookies! They look delish! Can I use regular sugar instead? You could, it just doesn’t melt as fast.